The William Blake Archive is pleased to announce the publication of the electronic edition of The Pickering Manuscript (c. 1807). In 1803, after three increasingly unhappy years in Felpham, Sussex, as artist-in-residence for William Hayley, Blake wrote in a letter to his friend and patron Thomas Butts, “O why was I born with a different face / Why was I not born like the rest of my race” (Erdman pages 733-34). He varied that couplet only slightly in the separate poem “Mary,” which at some point he copied neatly into a 22-page manuscript with nine other poems—seven known from no other source—on paper that he reutilized from Hayley’s Designs to a Series of Ballads, 1802 (to which Blake had contributed engraved illustrations). On the spacious inside margins he wrote out the ten poems that constitute what is conventionally known as The Pickering Manuscript—after one of its several nineteenth century owners. In the final manuscript version, the clarity and formality of the hand, the neatness and uniformity of the arrangement, the scarcity of changes, and even the number of poems tantalizingly suggest a specific occasion for the collection. But there are no designs, no title page, and no concrete evidence to indicate Blake’s intentions. The manuscript remained with Blake’s wife Catherine after his death in 1827. The poems were not published until 1866—the year Pickering bought them. In attempts to capture the character of the collection in a title, it has also been called the Ballads Manuscript (Bentley) and the Auguries Manuscript (Johnson and Grant). All the poems have strong precedents in earlier work—characteristic subject matter, ideology, and attitude; ballad- and hymn-like structures built upon characteristic rhythms, rhymes, and repetitions; a striking talent for aphorism and invented proverb; and strong ironies in strange mixtures of story and saying, among other familiar traits. 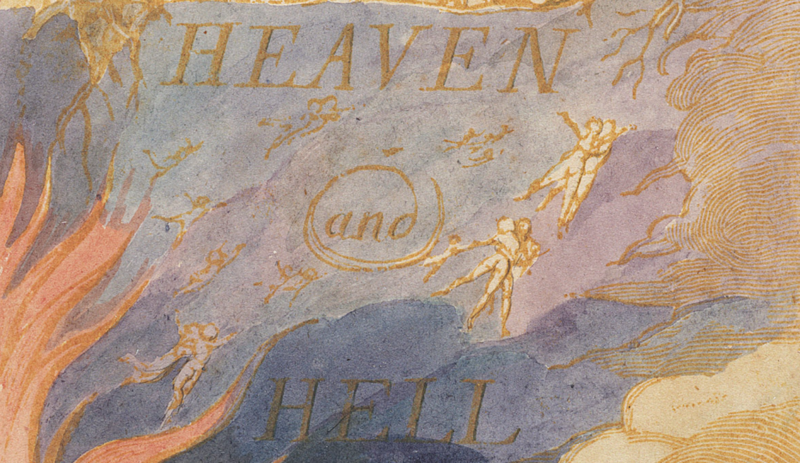 No one who has read the Songs and the Proverbs of Hell in The Marriage of Heaven and Hell will fail to recognize the poetic neighborhood of The Pickering Manuscript as Blake’s. But he must have sensed that he had produced ten particularly masterful poems underwritten by an increasingly codified mythology. The elegant, memorable, dark “Mental Traveller” comes across as a module that Blake could easily have slipped into his more extended mythopoeic ventures—extraordinarily concise but enigmatic, as if it can simultaneously know precisely what it is about but remain baffling to readers who want to crack its code. But other poems beckon to readers (and poets, artists, and musicians, because these are among Blake’s most influential lines) who prefer unsparing social insights balanced against hope and healing. This attractive, popular Blake is best represented in the long aphoristic sequence “Auguries of Innocence,” where it is possible “To see a World in a Grain of Sand / And a Heaven in a Wild Flower / Hold Infinity in the palm of your hand / And Eternity in an hour” (object 16). Miraculous acts of imagination can be achieved even in a world where “The Harlots cry from Street to Street / Shall weave Old Englands winding Sheet” (object 18). The Pickering Manuscript follows An Island in the Moon as the second major project overseen by the Archive team from the University of Rochester’s department of English. The manuscripts, like other works in the Archive, have fully searchable texts and images supported by our ImageSizer application; by the Archive’s revamped search engines, which allow more productive searching; and by the Virtual Lightbox, our new digital tool that allows users to examine images (including images of texts) side by side, as well as to manipulate them for close study. The manuscripts feature zoomed images of textual cruxes to strengthen the explanatory power of Editors’ Notes. A sophisticated XML tagset integrated with a straightforward and legible color coding system (using XSLT and CSS) reduces the clutter of conventional textual signs and symbols. A simple key to the color coding is available from every page of the transcriptions.